Just as tiny transistors transformed electronics a few decades ago, and scientists are now challenged to make them even smaller, our Stone Age ancestors felt the urge to make tiny tools. Going small may have helped some humans survive the last period of rapid climate change, 17,000 years ago, says Justin Pargeter, shown above in Emory&apos;s Paleolithic Technology Lab. The journal Evolutionary Anthropology is publishing the paper — the first extensive overview of prehistoric tool miniaturization. It proposes that miniaturization is a central tendency in hominin technologies going back at least 2.6 million years. Small flakes were like disposable razorblades or paperclips are today — pervasive, easy to make and easy to replace. 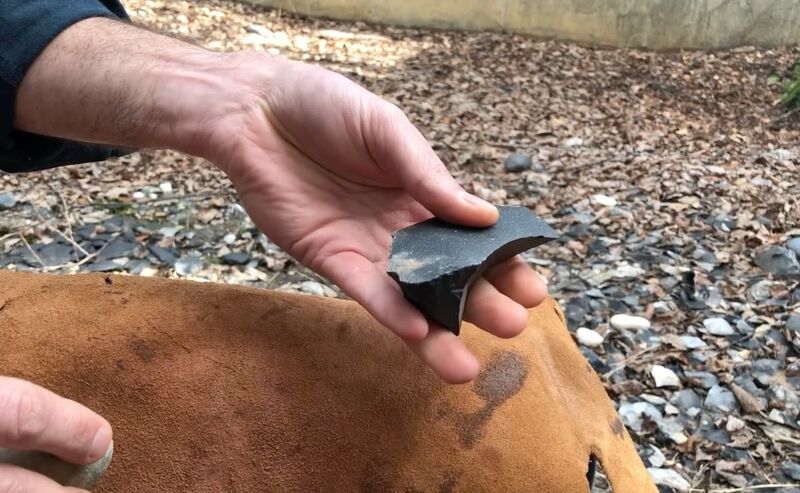 The paper reviews how stone flakes less than an inch in length — used for piercing, cutting and scraping — pop up in the archeological record at sites on every continent, going back to some of the earliest known stone tool assemblages. These small stone flakes, Pargeter says, were like the disposable razor blades or paperclips of today — pervasive, easy to make and easily replaced. Justin Pargeter makes tools himself to better understand how our ancestors learned these skills, and how they may have used the tools. He identifies three inflection points for miniaturization in hominin evolution. The first spike occurred around two million years ago, driven by our ancestors’ increasing dependence on stone flakes in place of nails and teeth for cutting, slicing and piercing tasks. A second spike occurred sometime after 100,000 years ago with the development of high-speed weaponry, such as the bow and arrow, which required light-weight stone inserts. A third spike in miniaturization occurred about 17,000 years ago. The last Ice Age was ending, forcing some humans to adapt to rapid climate change, rising sea levels and increased population densities. These changes increased the need to conserve resources, including the particular rocks and minerals needed to make tools. Pargeter demonstrates how our early ancestors likely used small stone flakes for cutting meat. A native of South Africa, Pargeter co-directs field work in that country along its rugged and remote Indian Ocean coastline and nearby inland mountains. 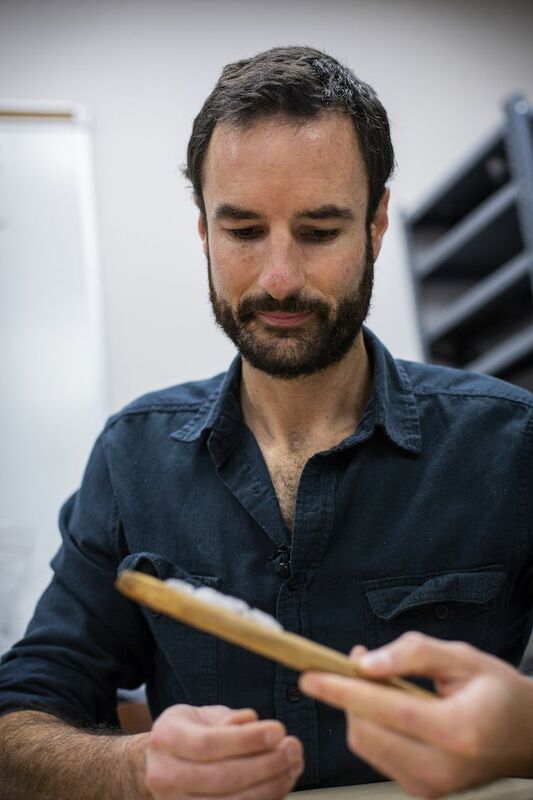 He is also a post-doctoral fellow in Emory’s Center for Mind, Brain and Culture and the Department of Anthropology&apos;s Paleolithic Technology Laboratory, where he collaborates on experimental archeology projects with the lab’s director, Dietrich Stout. Eventually, our ancestors learned to haft tiny flakes, like these that Pargeter made from quartz, onto a base. Pargeter’s work on tiny tools adds another facet to the lab’s investigation of human evolution. 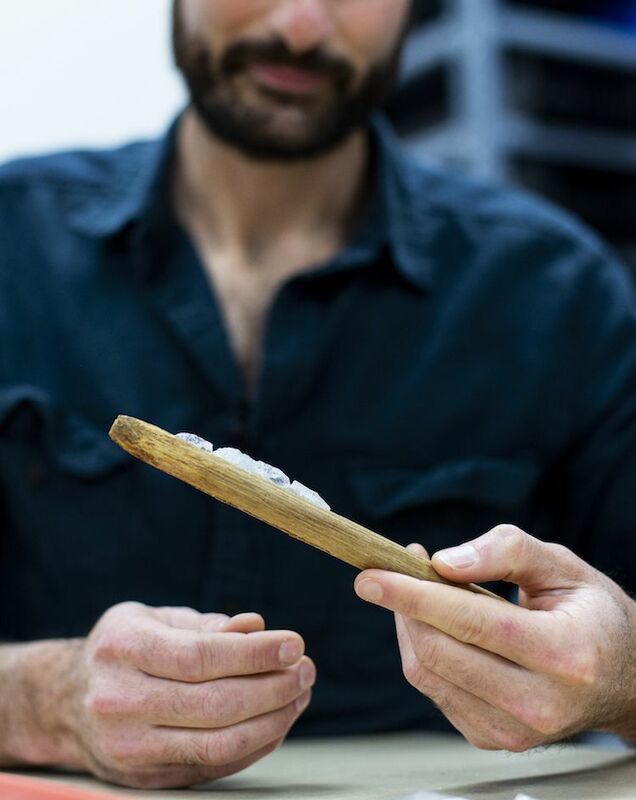 “He’s exploring what may have led to the compulsion to produce these tiny instruments — essentially the relationship between the tools and the human body, brain and the probable uses of the tools,” Stout says. The iconic, tear-drop shaped hand axe, which filled a human palm, required a large toolkit to produce, in contrast to a toolkit for tiny flakes. 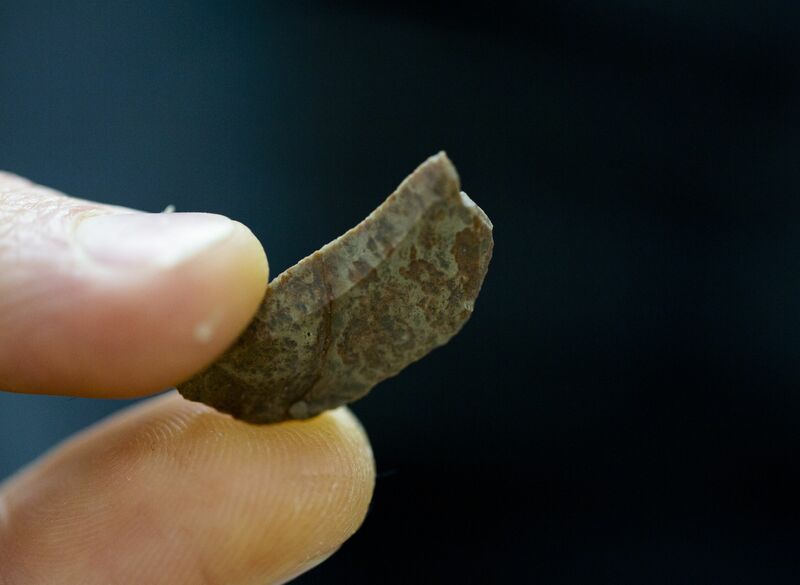 While dwarfed by the hand axe, tiny stone flake tools played a crucial role in human evolution, Pargeter says. When looking for a PhD thesis topic, Pargeter first focused on collections of larger implements, considered typical of the Stone Age tool kit. He pored over artifacts from a South African site called Boomplaas that were in storage at the Iziko Museum in Cape Town. As he rummaged through a bag labelled as waste — containing small flakes thought to be left over from making larger tools — something caught his eye. A sliver of crystal quartz looked like it had been shaped using a highly technical method called pressure flaking. was also an important Stone Age raw material. Pargeter began thinking of this question in terms of the age of the flake — about 17,000 years — and the environment at the time. The last Ice Age was ending and massive melting of ice at the poles caused the global sea-level to rise. In parts of South Africa, the rising oceans swallowed an area the size of Ireland. As the coastal marshes and grasslands disappeared — along with much of the game and aquatic life — the hunter-gatherers living there fled inland to sites like Boomplaas, currently located about 80 kilometers inland. The mountains around Boomplaas provided permanent springs and other dependable freshwater sources. Watch a video interview of Pargeter explaining his research. The climate, however, was less predictable, with sudden shifts in temperature and rainfall. Vegetation was shifting dramatically, temperatures were rising and large mammals were increasingly scarce. Archaeology from Boomplaas shows that people increasingly ate small game, like hares, that is difficult to catch and yields limited nutrition. Arrow points a little less than an inch across were already in the archaeological literature, but the Boomplaas crystal quartz flake was half that size. In order to bring down an animal, Pargeter realized, the Boomplaas flake would need poison on its tip — derived either from plants or insects — and a high-speed delivery system, such as a bow and arrow. How the Boomplaas flake may have been hafted for use in hunting. “The link shaft goes into the animal, sacrificing the small blade, but the arrow shaft pops out so you can retain this more costly component,” he says. “Our ancestors were masters of aerodynamics and acted like engineers, rather than what we think of as ‘cave people.’ They built redundancy into their technological systems, allowing them to easily repair their tools and to reduce the impact of errors." 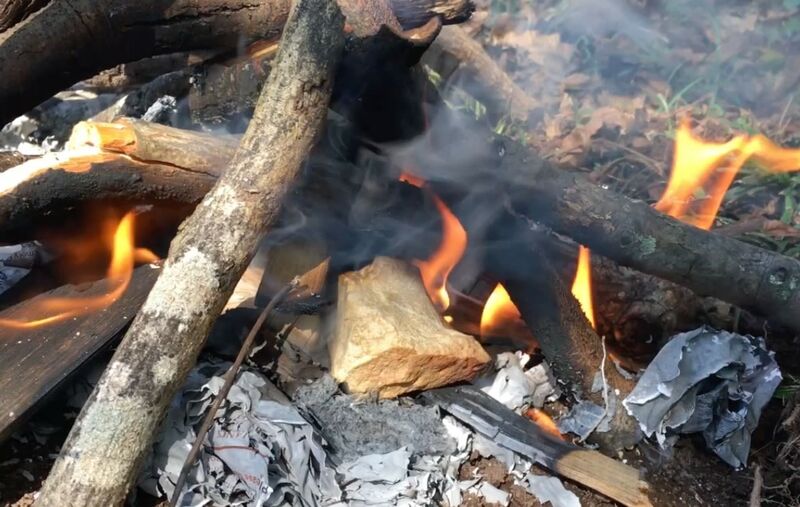 Heating silica-rich rocks turned them into better material for making small tools. Crystal quartz, important to modern-day electronics, was also an important Stone Age raw material. Its prism shape allowed an expert toolmaker to quickly strike off small elongated flakes. And quartz’s piezoelectric properties — its ability to generate an electric charge — may have added to its ancient allure. 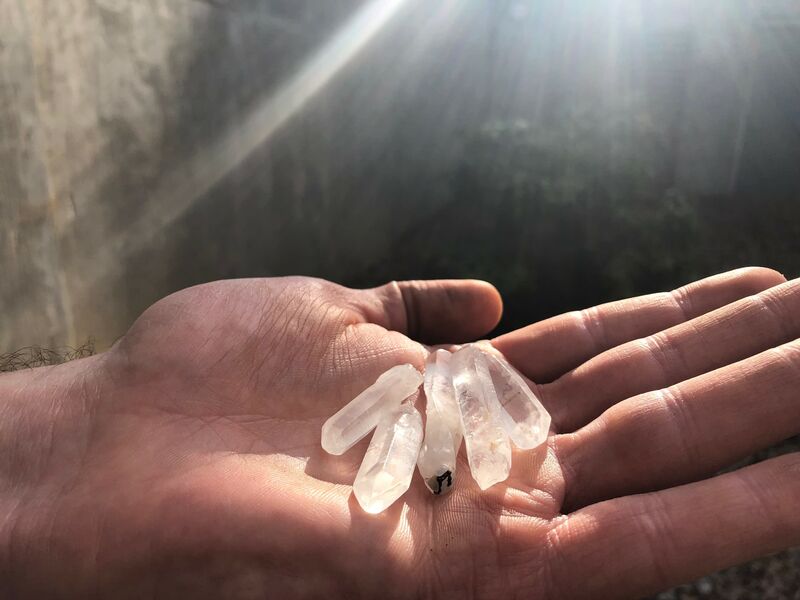 A piece of crystal quartz lights up as a toolmaker strikes it. The chimpanzee hand can use a large rock as a tool to crack nuts.